Harry Potter has not lost its magic but continues to draw new fans and also excite the old ones. 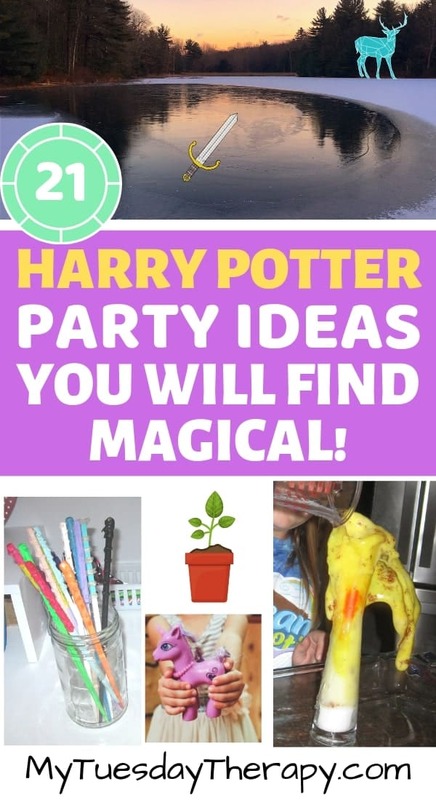 Many of us have either hosted or attended Harry Potter themed parties. And those parties are always awesome! Drinking butterbeer and playing Quidditch never gets old. 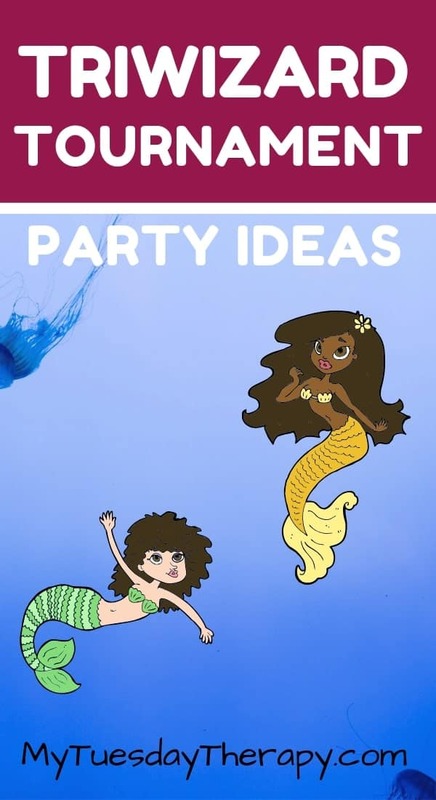 But if you’d like to have a new twist to your themed party I have a few ideas for you. The “themes within a theme” :). 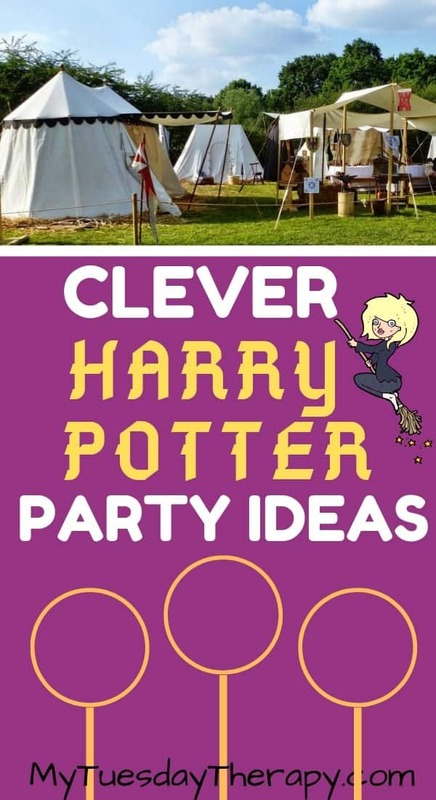 This fun sporting event would be a perfect theme for Harry Potter party! Wizards from all over the world gathered to this amazing competition to cheer on their favorite players. You will earn the Awesome Hostess award by hosting this event followed by a big sleepover in the backyard! It can seem like quite the hassle to build your quidditch game but it will be all worth it. You’ll find many tutorials online. Though, you won’t be flying on the broomsticks, I bet this will be a party they will talk about long after. You’ll have fun playing the Quidditch game and eating special theme fitting food. Harry and Ron found the Gryffindor Sword in a pond in the Forest of Dean. Ron used the sword to destroy the horcrux locket. Set up a tent and have a sleepover outdoors. Sit by campfire and tell stories while roasting marshmallows. A scavenger hunt looking for the Gryffindor Sword would be pretty fun. 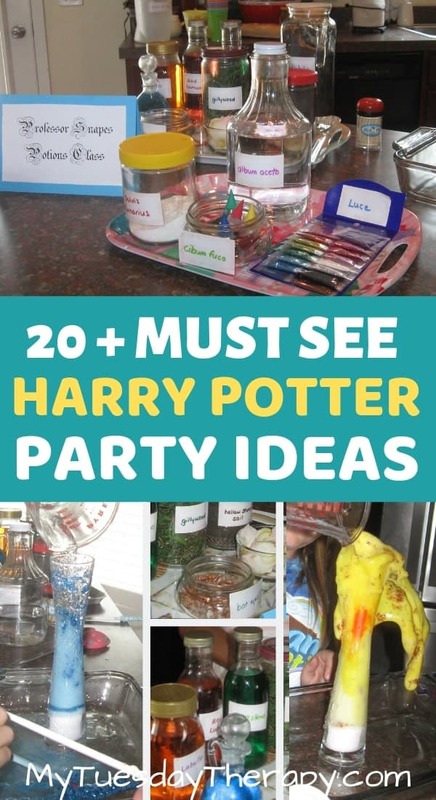 This would be an awesome Harry Potter birthday party idea for a teen. Diagon Alley is the magical shopping area for the wizards. The hidden entrance to the Diagon Alley is through the Leaky Cauldron – a dark little gloomy pub and Inn. 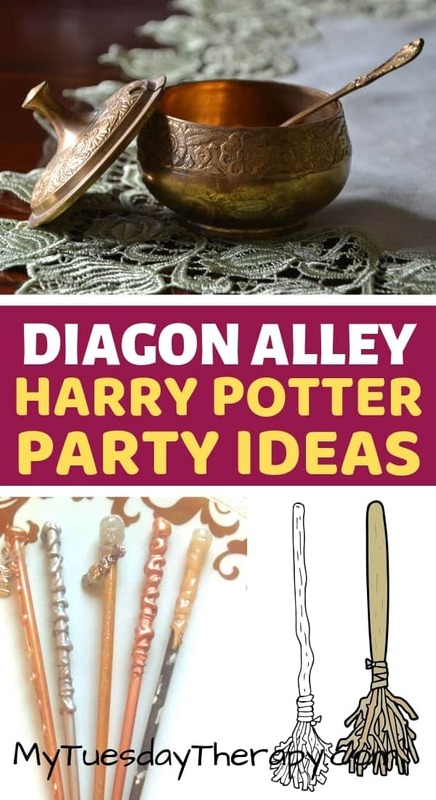 Create your Leaky Cauldron entrance to your party. Appoint the special brick that needs to be tapped three times for the door to open to the Diagon Alley. Set up a few shops in your party area and organize awesome activities in them. 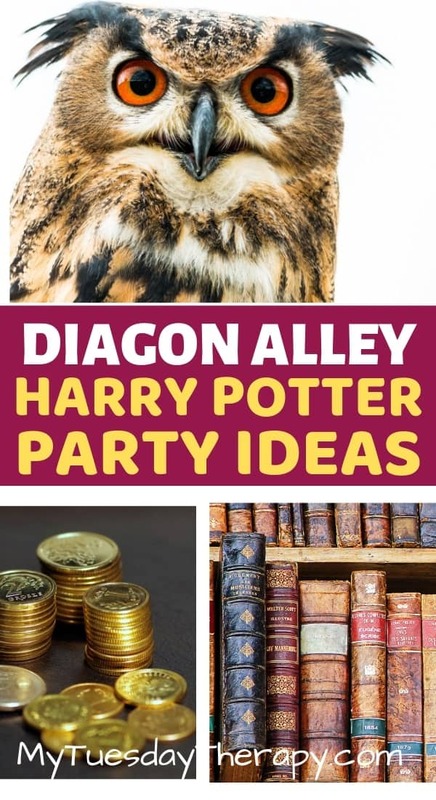 Your kids and guests will have a terrific time wondering around Diagon Alley. Eat cake and other goodies in one of the many cafes in Diagon Alley or have treats in each shop. Place a few beanie owls for kids to buy or to look at. Decorate your ice cream shop with pictures of creative ice cream servings. Have tables and chairs for available for those enjoying ice cream. A bookstore where most of the Hogwarts students purchased their school books. Books all over the place: tables, chairs, bookcases. Stack up chocolate coins on the bank counter. Game: What’s in the vault. Put items in boxes or bags and have the kids guess what’s in them by shaking them or feeling them through the wrapping. Food: Parfait in fancy glasses. Activity: make a wand. All you need is acrylic paint, sticks or chopsticks and hot glue to give your chopsticks texture. Decorate the shop with inexpensive brooms from dollar store. A stationary store in Diagon Alley selling quills, ink, and parchment. I’m not into pranks etc but if you can come up with a few harmless things to put in your joke shop I think your party guests will love it! 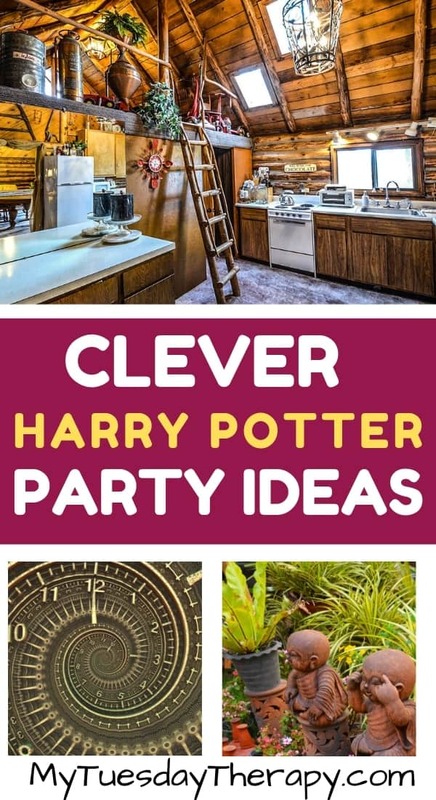 This party is probably the most common Harry Potter party nevertheless it is always a hoot. Always one of the favorite ones. The kids have a blast making their potions. I used the google translator to give some of the ingredients their latin names. 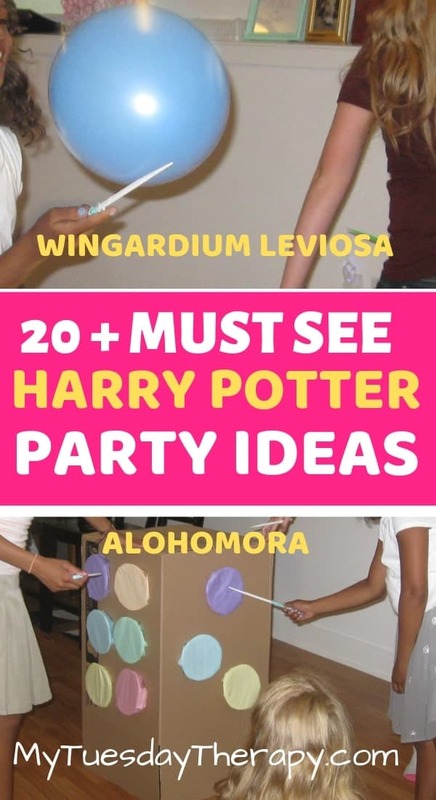 Teach a few wand moves and learn a couple of charms like Wingardium Leviosa and Alohomora. Wingardium Leviosa is a charm used to make objects fly. You can try it on balloons. My daughter and her friends had fun keeping balloons afloat with their awesome wands. Alohomora is also known as Thief’s Friend. It is used to open doors and windows. We made the box (picture above) filled with goodies to practice the Alohomora charm. Cut out openings for the foam bowls. Fill the bowls with goodies. Cover with tissue paper. Insert into the holes. You might want to glue or tape them to keep them in place. The kids used their wands and the alohomora charm to open the surprise bowl. Plant a flower or herbs for everyone to take home. Or make cute moss creatures. In our party the magical creatures had escaped and the girls had to go find them. Our magical creatures were my little ponies and unicorns that were scattered all over the yard hiding. 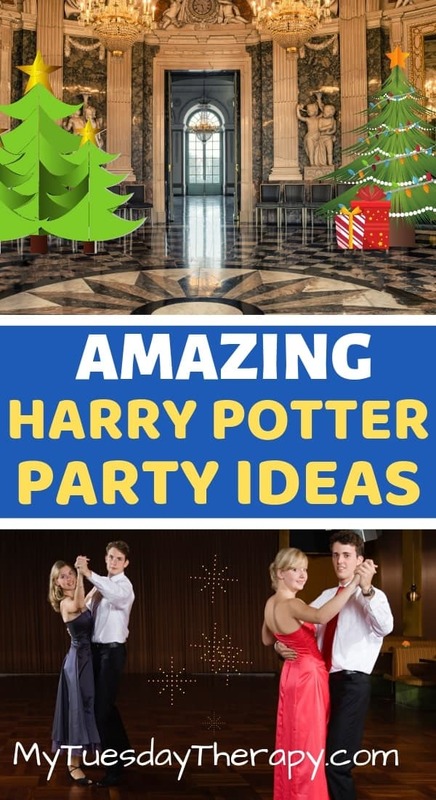 Create Hogwarts Common Rooms with the easy ideas in the HARRY POTTER PARTY ON SMALL BUDGET. Each Common Room is so different from beautiful airy, starry-sky Ravenclaw Common Room to creepy, greenish Slytherin Dungeon under the lake. We hosted a fun party where the kids were guests of a particular Hogwarts house. They spent a lot of time in that common room but also visited the others to play games and do other activities. 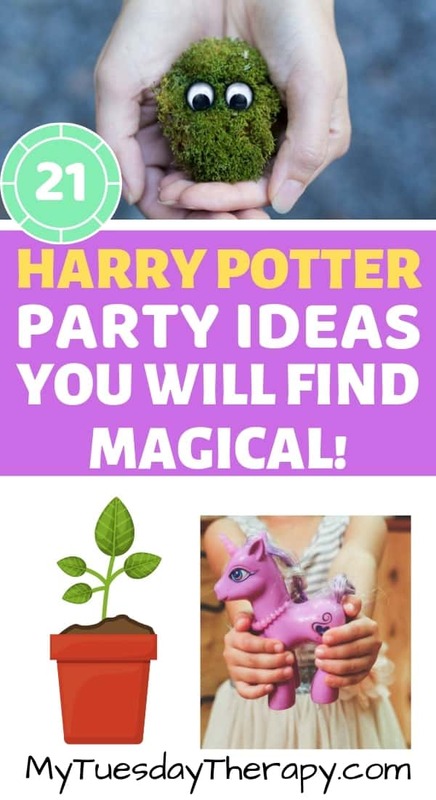 Check out HARRY POTTER ACTIVITY IDEAS. Get Marauder’s Map Cribbage Board from Unique Wood Products 1 and let the race begin! Collect points for your Hogwarts House as you move through the Hogwarts Castle. If you don’t have a fireplace you can find a fireplace video on youtube and display that. Or make one from a cardboard box and use red Christmas lights for fire. Place a jar of Floo powder next to the fireplace. Weasleys had odd clocks. The clock in the kitchen told things like “time to make tea” or “you’re late”. The Weasley clock was in the living room. It had nine golden hands one for each member of the family. This clock showed whereabouts of each family member. Weasley family had quite feisty garden gnomes and every now and then they de-gnomed the garden. De-gnoming could be one of your party activities. Hide gnomes (print or draw them) in the party area and send the kids looking for them. Who finds the most wins. You’ll have a great time working together on a 3D puzzle featuring the Burrow. Remember the excitement when Harry Potter, in his fourth year, was one of the contestants in Triwizard Tournament — a magical sporting event between three wizarding schools. As the guests arrive ask them to write their name on a paper and place it in the Goblet of Fire. Select a bowl to be your goblet. Tape the paper flames on the inside of bowl rim. 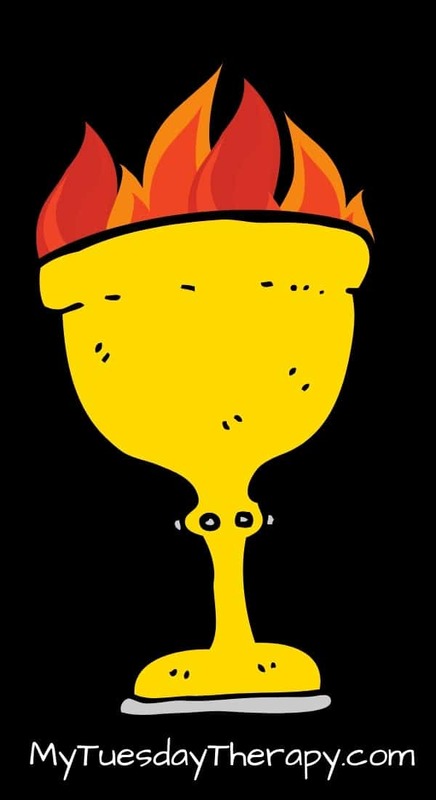 And like magic you have a Goblet of Fire DIY! Depending how you want to run your Tournament Party you could either select three contestants at a time by pulling their names out of the Goblet of Fire or read out everyone’s names at once. Harry and the other contestants had to fight a dragon that was protecting the golden egg. Each contestant faced a different dragon. 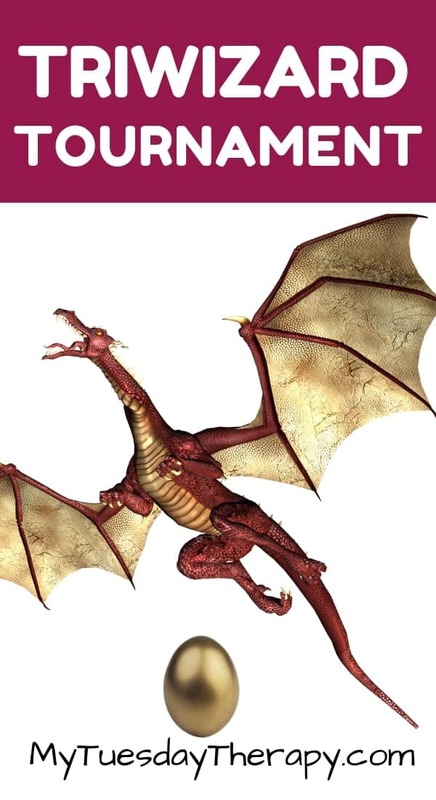 You probably don’t have dragons but can create other obstacles. Maybe set up a dragon bowling course. The players need to reach certain point level to get to the egg. Hot glue plastic dragons to bowling pins. And there you have your awesome Dragon Bowling Pins for your amazing Harry Potter Triwizard Tournament Party! In the story there was a clue inside the egg about the next task. You could also fill it up with a little sweet surprise. In the Harry Potter story, each contestant had to rescue a loved one whom the mermaids were guarding. To keep everyone safe: Do not tie anyone to a pole underwater. Okay. Now that we have made sure that nothing like that is going to happen we can move on to the task. It would be awesome if you have a pool or can host the party at lake. Attach mermaids to floats (so they don’t sink) to “guard” the treasures. Scatter diving toys in the pool. Send the kids looking for them. And the final task is going through a maze in search of Triwizard Cup. This could be done as a scavenger hunt with clues and tasks. 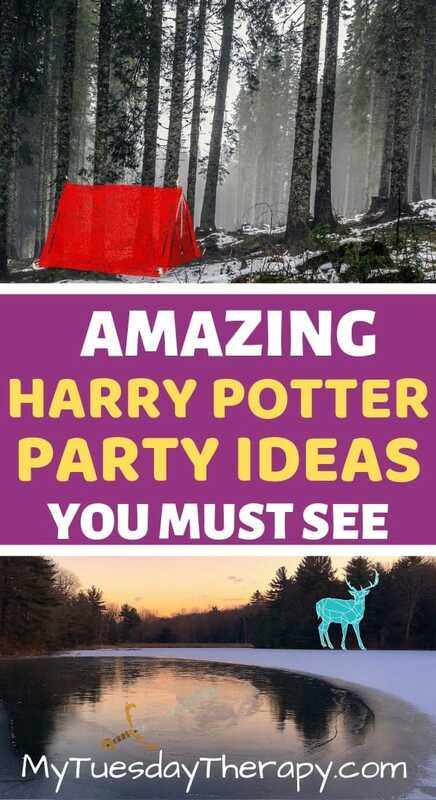 This Harry Potter themed party will be so much fun! 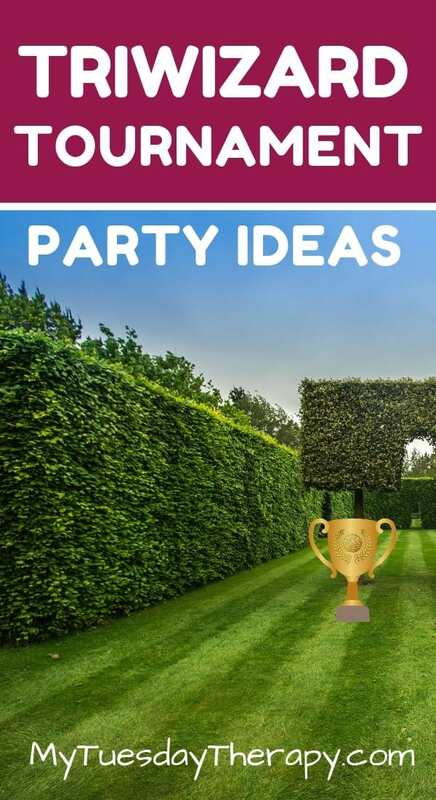 A party that I could see teen boys liking too… if you can make it challenging enough. All the students fourth year and above were invited to this grand celebration on Christmas Day. 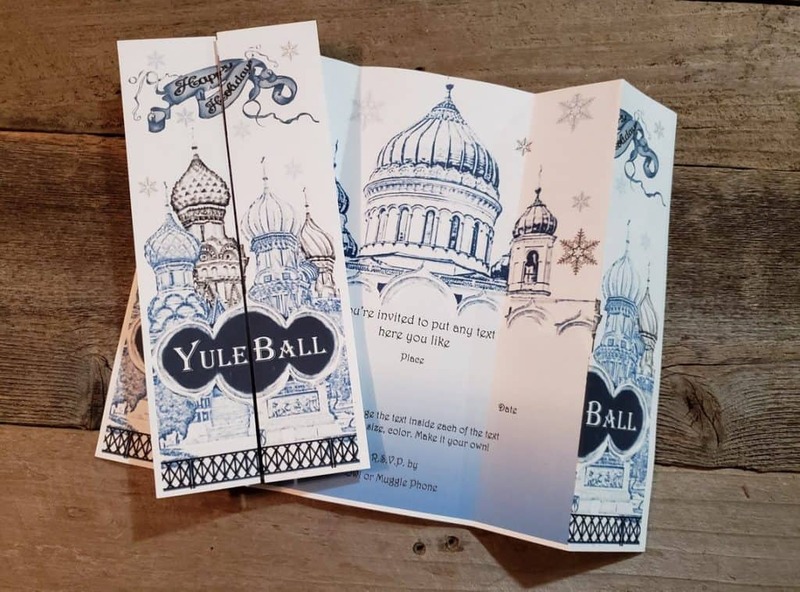 Your guests will be delighted to receive these creative Yule Ball invitations. Get the printable from Mianne Market. Decorate your ballroom with fairy lights. Christmas lights will do too :). Tape them to the ceiling and hang them from the curtain rods for a beautiful effect. Host a feast and serve delicious food such as goulash and stew just like they did at Hogwarts. Or have snack tables at the ballroom to keep the crowd fed and happy. Maybe you won’t be able to recruit the Weird Sisters band but a fabulous playlist will keep the guests dancing and having fun. The first person gets in the middle and does a dance move. Then she goes back to her spot. The next person goes to the middle and does the first person’s dance move AND a new move. The third person does the first two moves and adds another. And so on until the last person gets in the middle and has to do everyone’s dance moves. 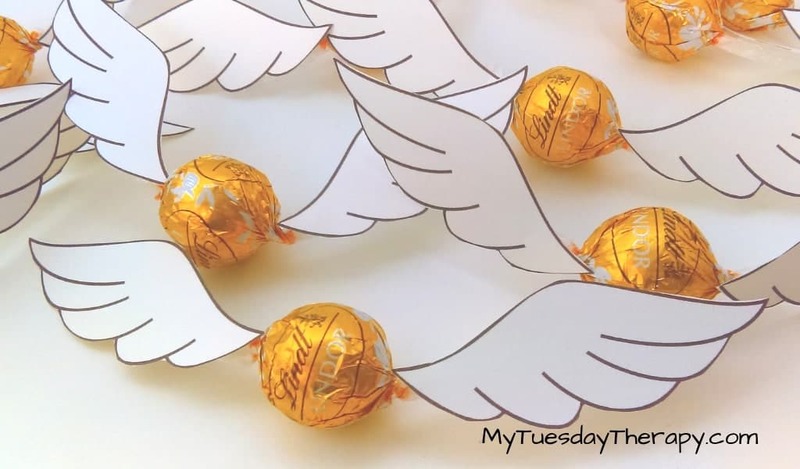 Join My Tuesday Therapy Subscribers and have awesome party and activity ideas delivered to your email inbox!